Booklist - 07/01/2015 Polacco introduces readers to another inspirational teacher from her past in this stirring tale. Trisha is nervous about attending a writing class with Miss Keller, who has a reputation for being a harsh grader. 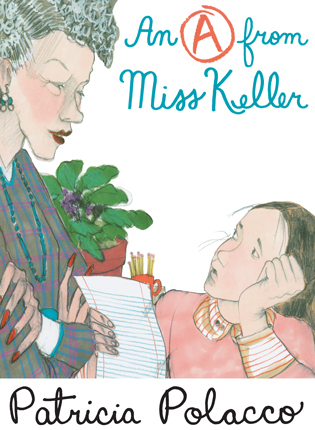 The strong-willed Miss Keller introduces her students to a thesaurus, takes them on field trips, and assigns a variety of writings. But all of Trisha’s attempts meet with disapproval, since Miss Keller believes her writing “lacks emotional connection.” In talking with her beloved neighbor, Pop, Trisha learns that his sons also had “Killer Keller” and that she was instrumental in helping one of them achieve his dream of becoming a journalist. When tragedy strikes, it touches the girl deeply, and she ends up pouring out her feelings in a final assignment, unconcerned with her grade, simply needing to put thoughts to paper. For the first time, Miss Keller is touched, feels Trisha’s pain, and, in fact, shares it. This story from the author’s life, colorfully illustrated with pencils and markers in her signature style, is affecting, engaging, and informative. - Copyright 2015 Booklist. 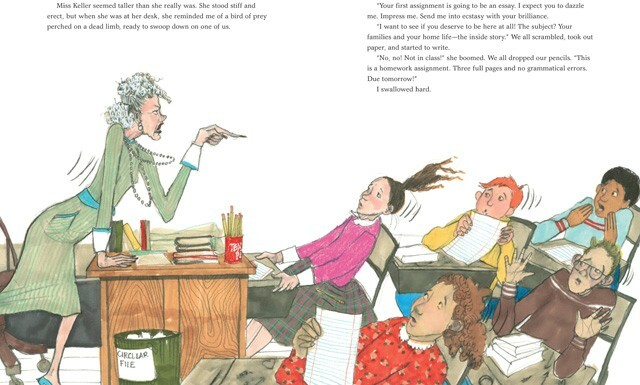 School Library Journal - 10/01/2015 Gr 1–4—Trisha is nervous about taking Miss Keller's advanced writing class. True to the rumors, this teacher is tough, taking pains to critique Trisha's lack of emotional connection in her writing. Trisha visits with her neighbor Pop for encouragement, and he shares stories about his beloved wife and sons, who also took Killer Keller's writing class. After learning of Pop's death by sudden heart attack, Trisha writes down her feelings without worrying about her grade, and Miss Keller tells Trisha she has "given [her] words wings," finally earning an "A." The text maintains a conversational tone throughout ("Guess what?" and "She actually hugged me!") to tell this personal story of loss and growth. Polacco's colorful illustrations are engaging, with pencil lines used in the characters' facial expressions to evoke a range of emotion, from Miss Keller's birdlike scrutiny to Trisha's anxiety and heartbreaking grief. The middle school setting may make this text-heavy picture book better suited for independent reading or for sharing with older children. Add Miss Keller to Polacco's collection of inspirational teachers, including Mr. Falker, Mr. Lincoln, and Miss Chew. VERDICT A recommended general purchase, especially where longer picture books are needed.—Hannah Farmer, Seguin Public Library, TX - Copyright 2015 Publishers Weekly, Library Journal and/or School Library Journal used with permission.